If you are experiencing difficulty viewing this email, please click here. In addition to working in an ever changing business climate, family-owned companies face a host of unique challenges that often complicate the day to day running of the business. Berks Family Business Alliance (FBA) was created to address these pressing issues, helping businesses to find solutions to the complex issues that families working together often struggle to overcome. The Chamber strives to provide programming that is beneficial to our members. We hope you will take advantage of all the opportunities FBA has to offer! Need to Make a Connection? Check out the 2016-17 Gateway online here! Have you paged through the 2016-2017 Chamber Gateway publication yet? Enjoy features on why Greater Reading is a great place to live, work, and play - and locate the full Chamber Member directory inside! Check out the electronic version here! Financials are the Universal Yardstick – Learn More! "Financials for the Non-Financial Manager"
Financial success is the universal "yardstick." Without basic understanding of core financial management tools, it is challenging for you to manage your company toward profitability. Having a CFO or accountant doesn"t relieve you of that need. This program provides a plain language, easy-to-understand overview of the financial tools you need to manage effectively. And the workshop is presented by a non-accountant! Our facilitated Peer Groups are going strong! In fact, we will be starting a brand new group this fall. This new peer group will be facilitated by Dan Becker, Shareholder and the Managing Director of the Law Firm of Kozloff Stoudt Attorneys. He concentrates his practice in Business Law, Real Estate, Zoning and Land Use Law. Having grown up in a family owned business, Dan understands the impact of family dynamics on day to day decisions and long term planning confronting all family owned business. It is these family related issues that led Dan to pursue a career in the law. Dan has significant experience counseling family owned businesses on a variety of legal issues including establishing the proper form of business entity; mergers and acquisitions; the purchase and sale of real estate and business assets; as well as subdivision, land development and zoning matters. These groups are exclusive to family-owned businesses and are a great way to gather with peers, share common problems and experiences, and to learn how to deal with your unique situations facing your family business. We allow only one participant per group from each industry segment in order to avoid competitive concerns. To promote camaraderie and trust, enrollment is designed for a designated individual (not meant for a company to send different people at different times). Enrollment in a group is limited to Chamber members. Peer groups meet monthly (8-10 times/year) and the enrollment fee is $400. For more information on our new peer group, please contact Kim Musko, Member Services Manager at 610.898.7778. Kim Musko, Member Services Manager at 610.898.7778. Steve Fisher is a Partner in RKL's Audit Services Group and the Leader of the firm's Manufacturing and Distribution Services Group. He works closely with a wide range of clients, including many family-owned and privately-held businesses, to meet their accounting and financial reporting needs. In addition, Steve has significant experience working with clients executing mergers, acquisitions and financing transactions. Steve has a genuine interest in understanding the issues his clients face and brings a strategic approach to developing solutions that will help them realize their goals. Presenter Dr. David Lansky will share his research and experiences as a family business advisor and clinical psychologist during this webinar. Drawing from his new book, Family Wealth Continuity: Building a Foundation for the Future. Register here. Robbed. That was the first thought to cross my father's mind when he opened up our distribution facility last week, while the rest of the family was abroad seeing clients. Read more here. Summer Internship Program - At NO cost to you! The Greater Reading Chamber is partnering with the Berks County Workforce Development Board to recruit businesses to participate in a NEW program! Your business can provide work experience for students in the Greater Reading area... at NO COST to you! For more information on this youth internship program, view the full flier here. Ann Compton Takes You Inside the White House Press Room! Our special guest speaker for the Chamber's 103rd Annual Dinner is Ann Compton, Legendary ABC News' White House Correspondent (1973 – 2014). A distinguished and highly respected veteran of the White House press corps, Ann offers a historical perspective of the presidency and the biggest stories of our time. Ann was the first woman assigned to cover the White House by a television network. From her front seat at the press conferences, she covered seven presidents as well as innumerable life-changing and globe-altering events – from the end of the Cold War, to daily political dramas, to travelling with President Bush on September 11, 2001. No one is better equipped to provide the historical perspective of today's global events while offering a look forward to the impact of the daily headlines. Her first-hand knowledge of the people and issues that are shaping the future of this country will provide an outlook for the 2016 presidential election. Join us for this exciting event and celebrate the winners of the 11th Annual Greater Reading Top Businesses and the winners of the Greater Reading Entrepreneurial Excellence Awards! For more information on how you can become an "insider," please contact Bethany Kirkner, Director of Events Bethany Kirkner, 610.898.7779. You can also register by clicking here. Word has it…"Familiar faces will be on-hand and a "special surprise" guest will make an appearance! You won't want to miss this! 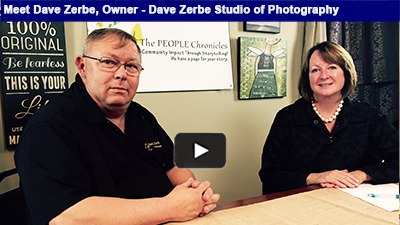 From pets to weddings, Dave Zerbe and his family have been snapping great shots for over 38 years! 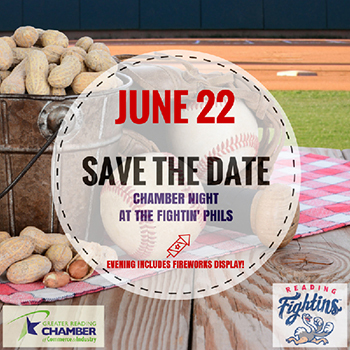 Chamber Night at the Fightin' Phils - June 22! Join fellow Chamber members at First Energy Stadium to cheer on our Fightins as they play the Akron RubberDucks! Evening will include fireworks & a game worn 'go green' jersey auction! ALL Chamber Member organizations will receive ticket packs in the mail the first week of June. If you need additional GA tickets, feel free to stop by the Chamber Office at 201 Penn Street, Floor 5, Reading, or call 610.376.6766 to make a request. DEAL ALERT! Chamber members can receive a special ticket UPGRADE price for June 22! Upgrade your GA ticket to either Deck Picnic or Pool Picnic tickets for $20 per ticket, a $5 discount! Both options include a 2.5 hour all-you-can-eat buffet. Offer valid until June 10th - these tix will be available on a first-come, first-serve basis. Please contact Ed at the Fightin' Phils Office to purchase the discounted tix (which will replace your GA tix) at 610.370.BALL ext. 204.